PRP or platelet rich plasma is a form of treatment using the patient's own blood which is becoming increasingly popular in recent times in treating a variety of conditions including hair loss. Platelets are a type of cells found in the blood of humans whose primary function is in clotting of blood. Platelets also contain a large number of growth factors which help in the stimulation of the healing process and it is these growth factors which are most useful for treatment of various conditions. 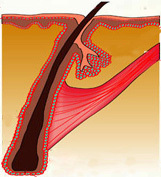 PRP is produced from blood. About 10 ml of blood is collected from the patient and this blood is then treated with some reagents and then centrifuged through a special double centrifuge method till a small volume, approx.. 1 ml of PRP is produced. The processing ensures that this small concentrated plasma is very rich in platelets. This is the PRP solution. This solution is then injected into the area to be treated so that the platelets release their growth factors at the site and cause healing. PRP has become most famous for being used by various highest level athletes like Tiger Woods and Rafael Nadal in treatment of injuries. PRP injected into muscular and tendon injury sites speed up the healing process significantly and is thus used for healing. It is also used in various orthopaedic lesions like Osteoarthritis where it brings about healing. PRP is also increasingly being used in hair loss lesions like Alopecia areata and also in Androgenetic alopecia or Male Pattern baldness. Alopecia areata is an autoimmune condition where a small round lesion develops due to an autoimmune process. PRP injected into such lesions help significantly in promoting healing up of these lesions. PRP is also increasingly being used in the most common type of hair loss, Male Pattern Baldness or Androgenetic alopecia. Although there were mixed results initially, various studies have now confirmed that PRP does work and gives good results in male pattern baldness. It is most effective in decreasing hair loss and has a minimal effect in growing new hair. In cases of progressive hair loss it helps to stop further increase in baldness. In cases of high hair fall and thinness/weakness of hair, it helps to stop further hair fall and also increases hair thickness and tensile strength. It is thus very useful for those who are having hair fall with chances of developing baldness, and also in those with hair thinness and weakness. PRP is administered in Arogyam Hair Transplant and Cosmetic Clinic. The latest techniques are used for PRP and imported vials and reagents are used. The whole process takes 1 hour. Prior booking has to be done for the procedure. Please call at 7637089211/8811077011 for further details and to book an appointment.